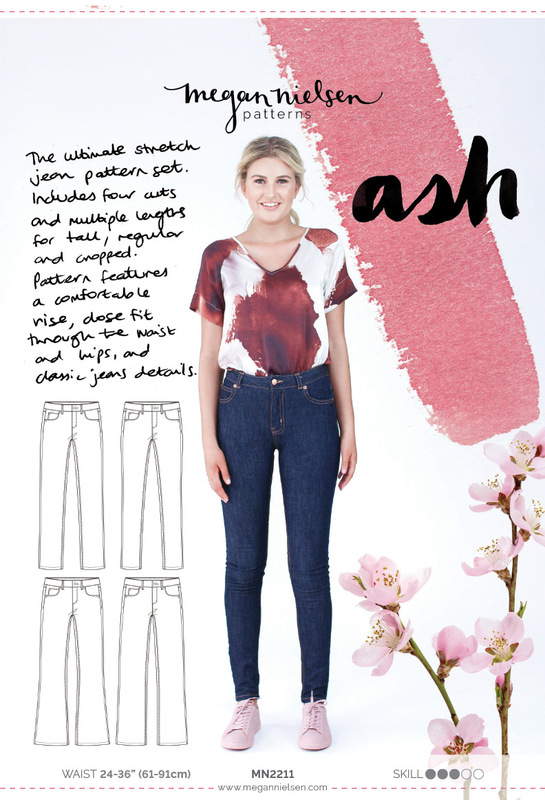 Ok, so we want to make sure your Ash jeans or your Dawn jeans are absolutely perfect for you, right? Well, Ash is made to have a very comfortable, modest rise – somewhere in between a mid rise and a high rise, and should sit below your navel and the Dawn has a high rise to sit on the natural waist. BUT… maybe you have a long torso and need it even higher. Or maybe you have a shorter torso and need your rise to be lower. So I’ll show you a quick and easy way to accommodate for that. 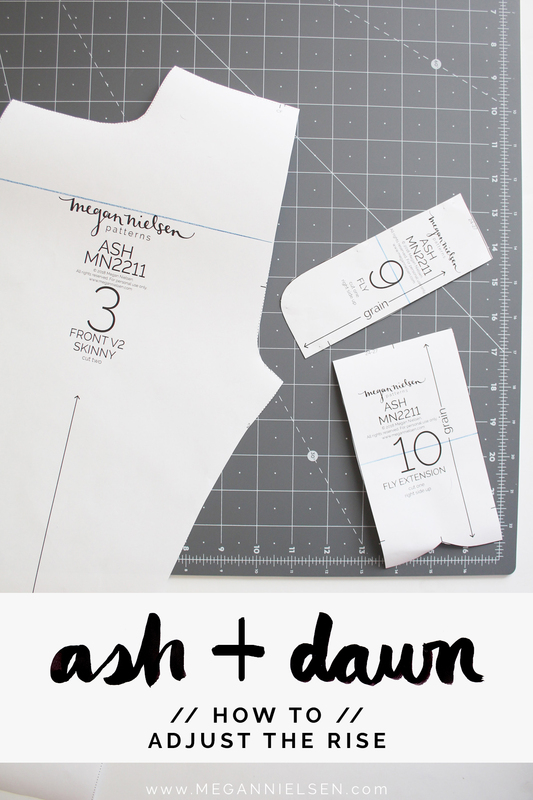 I’ve worked on Ash in this tutorial, but you can apply the sae steps with the Dawn pattern. 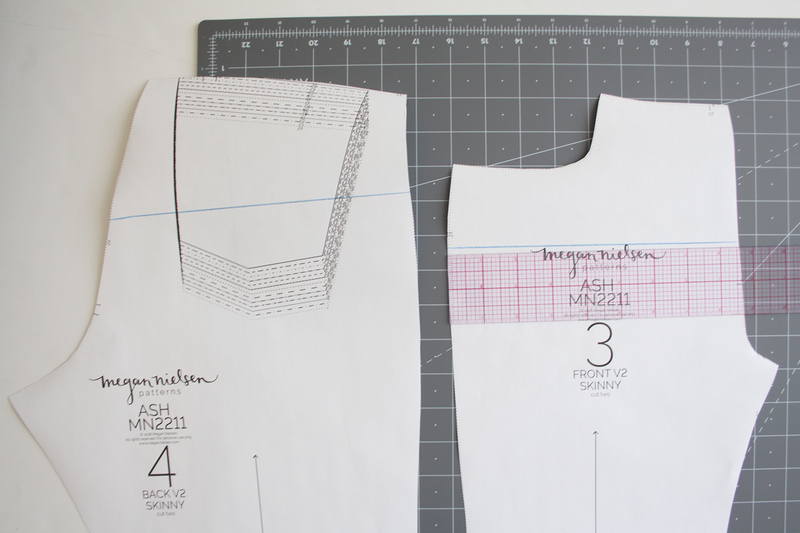 Adjusting the rise for your torso length affects the front and back pieces, the fly, and the fly front. So we will be modifying those pattern pieces. It will also affect the length of your zipper (if you’re doing a zipper fly), so keep that in mind! 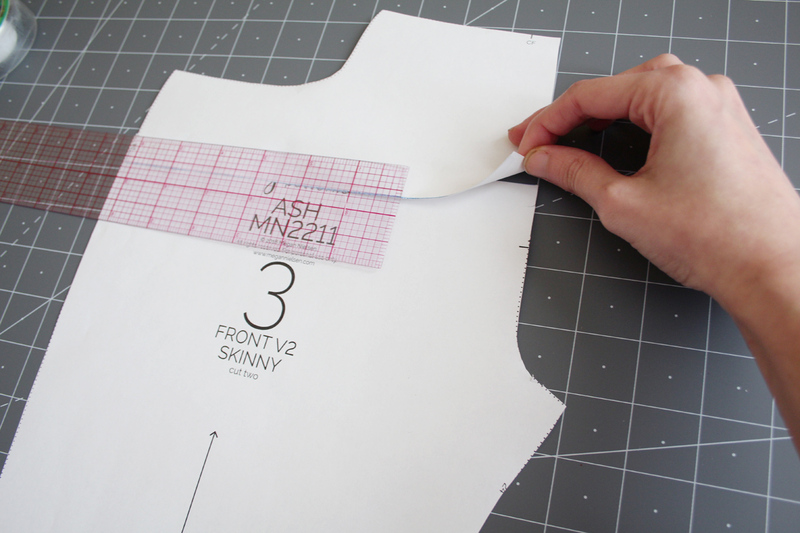 This method will help make sure that your waistband sits just below your navel as the pattern is intended to fit. However I know that some of you may want to adjust your jeans to be low rise or even high waisted so we will also touch on some tips for achieving that. Ok, I’m going to show you how to raise the rise first, and then I’ll touch on lowering it at the end. Let’s gooooo…. 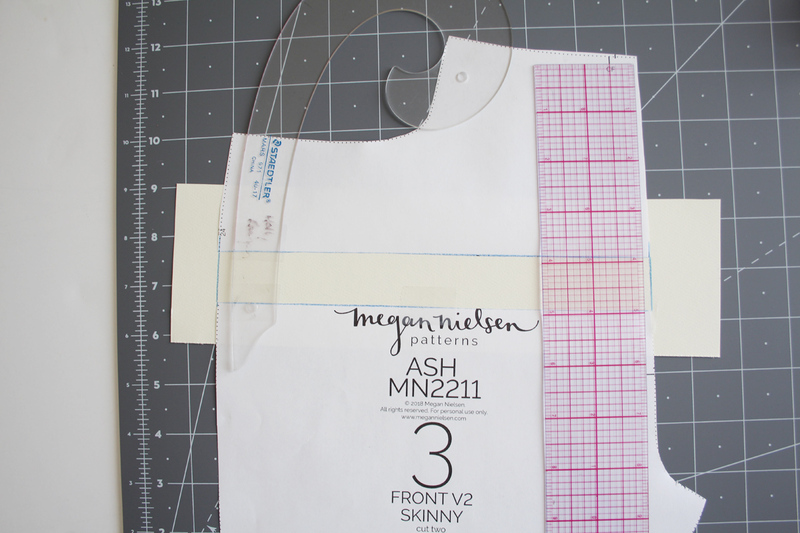 Draw slash lines across your front and back pieces. The exact spot doesn’t matter, just about halfway up center front/center back. Also draw slash lines across the fly and fly extension. Again, at about the halfway point or so. Cut all the way through all of these slash lines. Place a pice of paper underneath your front piece. Spread the two cut pieces by the amount you want to add to the rise. For this example, I’m raising it by 1”. Tape in place. Now draw new lines to connect the two pieces back together. 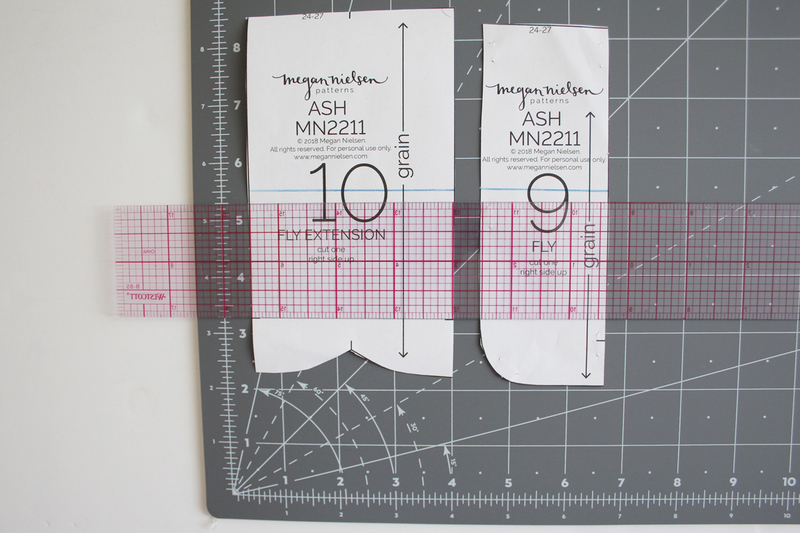 Use a straight ruler at center front, and a curved ruler/tool at the side seam. Cut out your new front piece. Repeat for the back. **NOTE – you will be slashing and spreading through the pocket placement markings. When it comes time to place your back pockets, still use the very bottom 3 points as your guide. Now spread the fly and fly extension by the same amount. For this example – 1”. Tape in place, and draw your new lines. Make sure the notches on the front, fly, and fly extension all still line up. This is important for construction! Ok, so say you want to lower the rise instead. 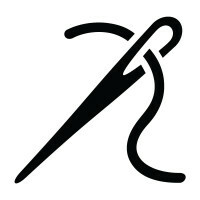 You will draw and cut your slash lines exactly the same. But instead of adding paper underneath and spreading, you will instead overlap the pieces by the amount you want the rise to lower (I did 1/2″ here). 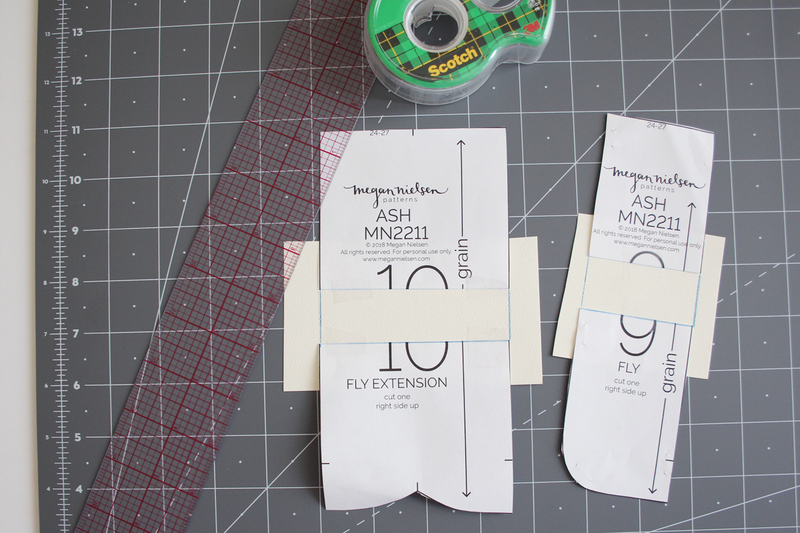 Tape in place, true your center seam and side seam. And repeat for the back, fly and fly extension – making sure to keep the overlapping measurement the same throughout. I know that some of you may want to alter the rise of the jeans to be closer to a low rise or even a high waisted jean. You can certainly do that, but you will need to put some careful thought into what size you cut and what adjustments you make. The reason for this is that when you use the method above to slash and spread the pattern, you are leaving the waistband fit and amount of ease unchanged. Unless you have the exact same body measurements from your natural waist to your natural hip, then you will need a different size waistband for low rise and a different size waistband for high waisted. 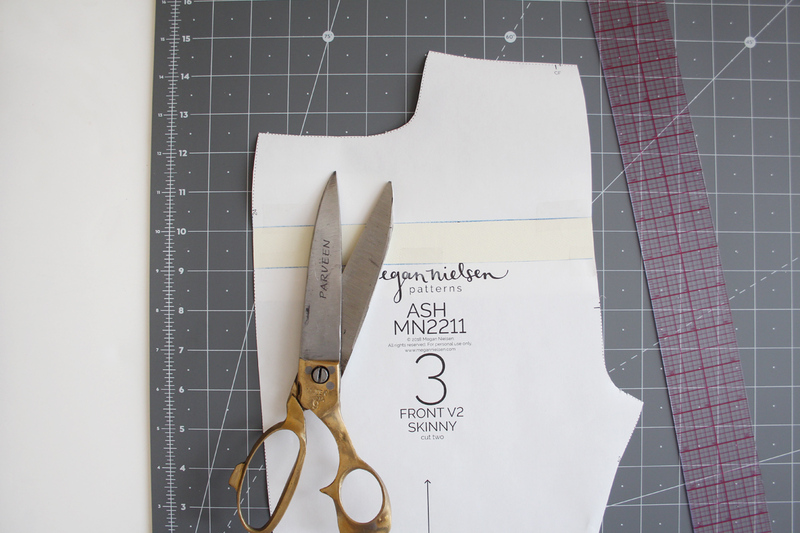 The most accurate way to adjust the pattern would be to lower the rise as above, then vertically slash and spread the waistband, yoke, front and back pattern pieces in order to add more ease to the waistline for low rise, or overlap to remove ease for a high waisted jean. That is honestly going to be a bit of a pain, so we’ve thought of a simpler hacky way for you to do it! 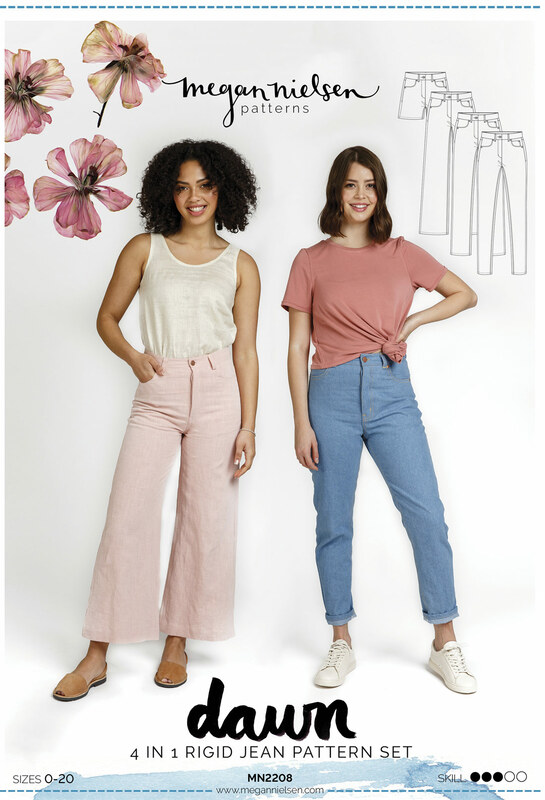 If you would like to use the above method to create a low rise jean, we would recommend choose your jeans size based on your hip measurement not your waist measurement as this will be more relevant for a low rise jean. From our quick guesstimates, if you move the rise down a few inches you should be able to use the waistband that corresponds to one or two sizes larger than the size you cut. For example if your measurements would usually put you in a 28 waist and 30 hip size, then you would cut a straight size 30 and reduce the rise as above. You would then do a baste fit for the side seams, as detailed in the pattern instructions, and see if you need to let out or take in your jeans. When it comes time to add the waistband you might find that that the size 31 or 32 waistband is a more comfortable fit for your hip region after these adjustments. To create a high waisted jean, you would first choose your size based on your waist and hip body measurements. 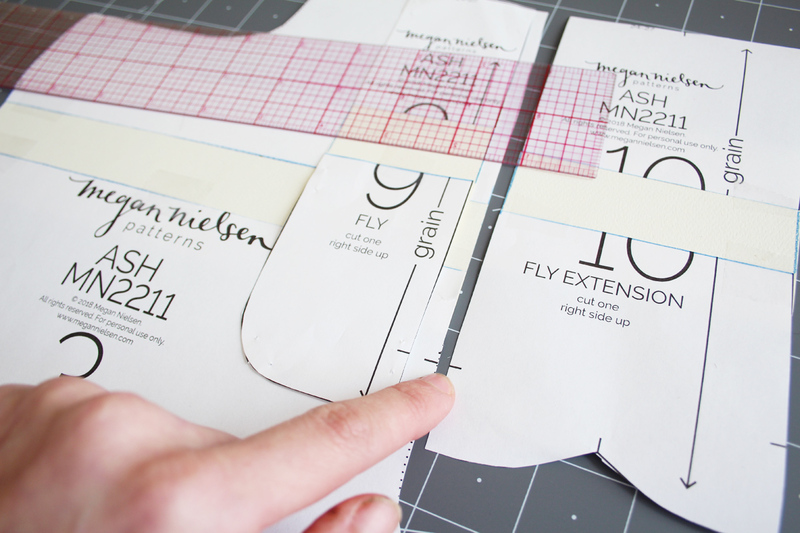 If they result in different sizes, you would blend between those sizes (see yesterdays tutorial for how to grade between sizes) and then you could slash and spread to increase the rise as detailed above, and then do a side seam baste fit. Once you try on your jeans you will be able to tell if you like the additional ease that is around your waist, or if you need to remove some. Then choose your waistband size. You may find that the waistband for the size smaller is a more comfortable fit. So if you are a size 28 waist and 30 hip, then you would cut you would blend between a 28 at the waist down to a 30 at the hips. 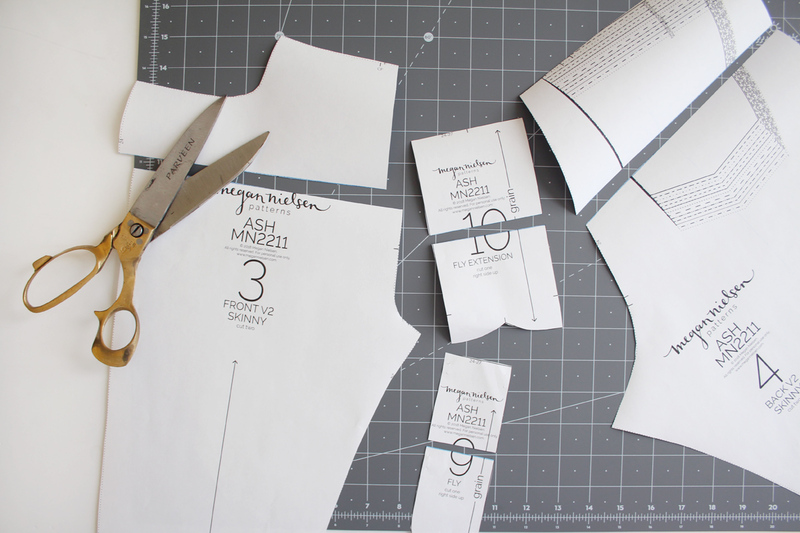 Then slash and spread your pattern pieces to lengthen the rise. 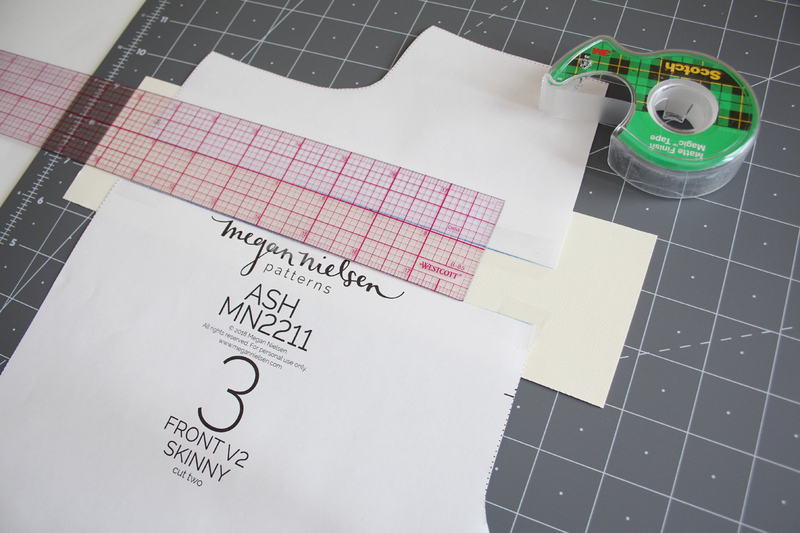 Then decide on the amount of ease after a baste fit, and then choose your waistband size.